What happens when you combine the Polynesian cuisine of Chef James McDonald (of Pacific'O and I'O Restaurant fame), the entertainment expertise of the folks who run the Old Lahaina Luau and one of the best beachfront settings in Hawaii? The answer is The Feast at Lele in Lahaina, Maui. Several years ago the Old Lahaina Luau relocated to larger quarters on the beach near the Cannery Mall in Lahaina. This left their old site empty. The property at 505 Front Street in Lahaina was much too valuable and desirable to stay vacant for long. The new occupant became The Feast at Lele. The name derives from the traditional Hawaiian name for the area now known as Lahaina. This area was once the capital of the Hawaiian Kingdom where royalty dined on the same beach that now hosts The Feast at Lele. The Feast at Lele is not a luau. You will not find the typical imu ceremony, multiple craft demonstrations or the familiar buffet line. The Feast at Lele is more like a fine dinner show than a traditional luau. While guests still receive a traditional flower lei greeting and photos are taken (later available for purchase), other similarities to a traditional luau setting end there. Rather than sitting en-masse with strangers, guests are seated at tables arranged specifically for their individual group size, whether it be a group of two or even ten or more. Each table has a tablecloth, china with silverware and cloth napkins. Guests receive very personal attention from at least two servers, after the model of a waiter and assistant found in many fine restaurants. Drinks are served to each guest at his or her table. There is no waiting in a drink line here. The open bar includes a wide range of choices ranging from the traditional Mai Tai's, Piña Colada's, Lava Flow's and Blue Hawaii's to beer, wine and an assortment of harder liquor. The "Feast" itself is the real star here, followed closely by the superb entertainment provided by a small, but highly talented, group of performers. The menu consists of a five-course meal featuring cuisine from Hawaii, Tonga, Tahiti, and Samoa, plus dessert. The Hawaiian dishes include the traditional imu roasted kalua pig and steamed moi, a rare fish once served only to Hawaiian royalty. Tongan dishes include octopus, lobster, and ogo salad as well as a delicious pulehu beef served inside freshly roasted squash. The Tahitian course includes Tahitian fafa - steamed chicken and taro leaf in coconut milk, as well as a wonderful bay scallop dish. The final island sampler features the cuisine of Samoa and includes grilled fish wrapped in banana leaf, palusami - breadfruit with taro leaf - and coconut cream, shrimp and avocado with lilikoi. Desserts include a caramel macadamia nut tart topped with haupia, Hawaiian chocolate truffles, and fresh exotic fruit. 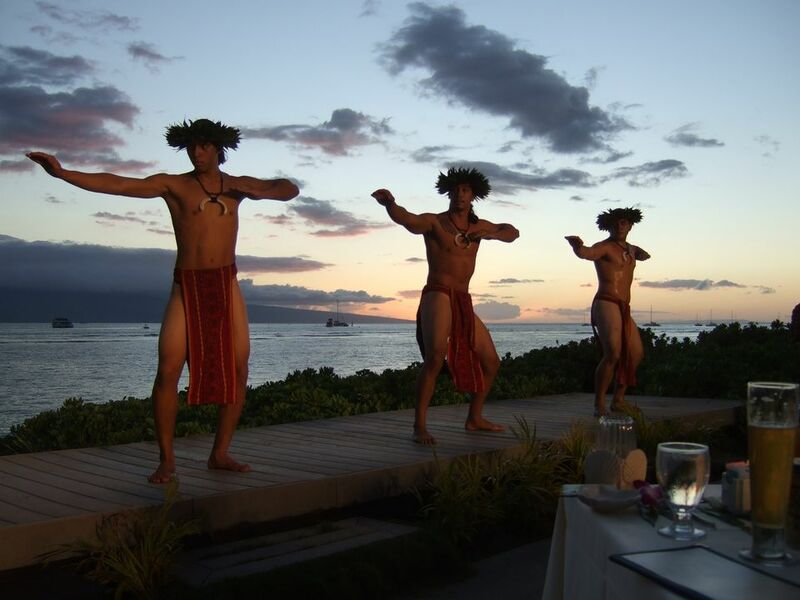 Each course is followed by dramatic Polynesian entertainment from each island. For example, the Hawaiian course is followed by Hawaiian hula, the Tonga course by Tongan dances, etc. Following the Samoan course guests are treated to an amazing fire knife dancer from Samoa. You will be amazed by the vast range of talent in these amazing dancers who have mastered the dance from four separate Polynesian cultures. The Feast at Lele is the closest thing to fine dinner theater that you will find in Hawaii. If you want to experience the fun of a Hawaiian or Polynesian luau, there are several excellent choices on Maui. If you want a fine dining experience with a selection of foods that you will likely never experience elsewhere, excellent service and top-notch entertainment, then The Feast at Lele is for you. Since we wrote our review, Adrian Aina has assumed the role of Executive Chef at The Feast at Lele. You can download the current menu and fact sheet for the Feast. The Feast at Lele is held daily. Advance reservations are required. Seating time varies by season. The price as of Summer 2017 is $140 per adult and $99 for children 2-12.